About a month and a half ago my family started watching the live stream video of the Decorah Eagles. We watched as the three adorable eaglets hatched (along with thousands of other viewers). We watched as the family weathered high winds, thunderstorms and even a late April snow storm. The eaglets continue to grow bigger each day and work on their skills. We can't wait to watch them fly for the first time. It's incredible to witness such an amazing miracle of nature live, right from our home! This certainly is technology at its best. We've learned a lot about eagles as a result of observing the Ustream feed. The eagle video stream inspired us to do a little research on eagles and over the last few weeks we have worked on a few related science activities and projects. 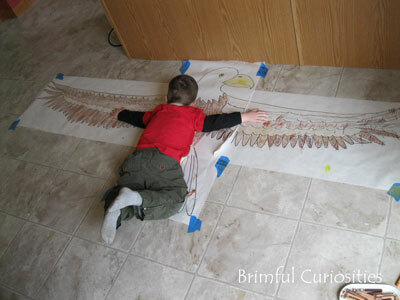 Using freezer paper, I drew a life-sized eagle with wings outstretched. The kids colored in the gigantic drawing. The wingspan of an adult female Bald Eagle is around 7 feet and average height is 3 feet! Males are smaller in size. Because we could not find any information on body width and head sizes, we just estimated that part of our drawing. This activity provides a neat, hands-on way to discuss size. 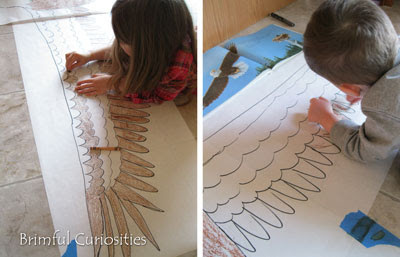 We looked closely at a real picture of an eagle and tried to color areas of the raptor accurately based on the photo. 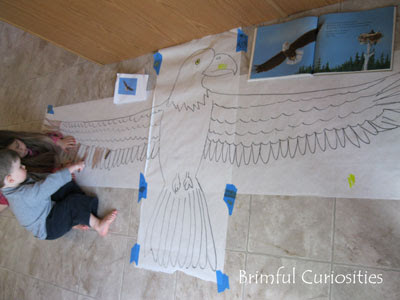 My kids, impressed at the size of the wingspan, compared their own armspans to the drawing. 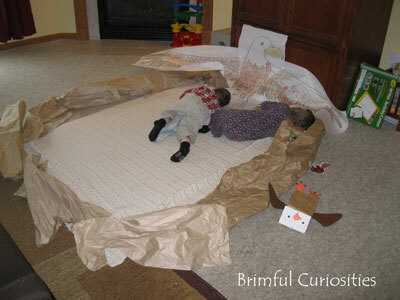 We used brown packing paper to construct a 6 ft. diameter nest in our living room. The Decorah nest is about 6 feet across, about the same depth and it weighs about 1½ tons according to the Ustream site. Bald Eagles reuse their nest and add new materials to it every year. My kids added the life-sized eagle drawing to the nest. They also pretended to be eagles and carried prey to the nest that we printed from the paper bag bald eagle puppet in school. Its wings flap up and down with your arm motions and the kids played with the puppet in the nest. We had fun making the eagle puppet feed pretend baby eaglets with its mouth, just like a parent eagle. Bald eagles lay one to three eggs. The dull white eggs are about 2"x3" and the incubation period is around 35 days. We drew a picture of a 2"x3" egg and compared it to a chicken egg. 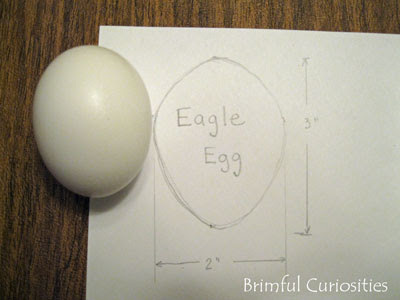 For more information, read the comprehensive RRP Blog post about Eagle Egg Questions and Answers. For a little background information on the eagle parents and eaglets, visit the Ustream website at http://www.ustream.tv/decoraheagles or the facebook page http://www.facebook.com/pages/Raptor-Resource-Project/. Also, The Des Moines Register published a nice article on the famous eagle pair and eaglets, "Decorah eagles are stars online, in person" that includes pictures of the nest on private property near the fish hatchery and an interview with Bob Anderson of the Raptor Resource Project, the man responsible for installing the eagle cam. Surprisingly, this is not the first time the Decorah, Iowa, eagles have found themselves in the spotlight. The nest was one of a few featured in the 2008 PBS Nature Documentary, "American Eagle." The episode is available for viewing online. It is fascinating and a little heart-wrenching! We learned that the Decorah male eagle had a previous partner, a one-eyed female that died during a snowstorm. Part of the video details this tragic event. The current Decorah female eagle also appears in the video about midway through and you can witness her first experiences as a mother. The eagle pair currently occupying the nest has been together since 2007-2008. And, just a warning for sensitive viewers -- the documentary briefly shows the effects of lead poisoning on an unrelated eagle after it eats bullets left in an animal carcass. Lastly, I wanted to mention an interesting blog I came across in my online search for information on Bald Eagles. Taking Flight discusses the raptor rescue and rehabilitation efforts of Raptor Education Group, an organization based in Antigo, WI. My daughter has expressed interest in ornithology and someday I hope to take her on a tour of a bird rehab center. In the meantime, we'll keep our eye on this site. The Taking Flight blog serves as a wonderful and fascinating resource for those wishing to learn about injured raptors and raptor care and it includes many pictures. It's a well-written, informative blog that both children and parents can enjoy. The blog regularly features Bald Eagles, including a fuzzy baby eagle rescued in April. This is great! I love all the life-size comparisons. My boys would love to do this. Wow! What an awesome learning experience for your children. I'll have to check out all of the resources when I get a chance. We did penguin exploration this winter and made life-size penguins- the girls loved it. The eagle is great. Thank you so much for sharing and for stopping by my blog. Wow! This is amazing. What a great way to really show them the size of the eagles and the nest. Such great ideas for learning about eagles! We've also watched the live stream of the Decorah eagles. What an amazing idea to make the life-size models! Thanks for the great links too. We'll definitely come back to this! This is so cute! I just put it on Facebook! I love bald eagles. This is the most awesome activity I've seen, especially the life size one! What a great snazzy idea..Amazing work..